Avoid games that provoke biting, and do not stick your fingers into the pup's face. Photo by Andrew Santos. 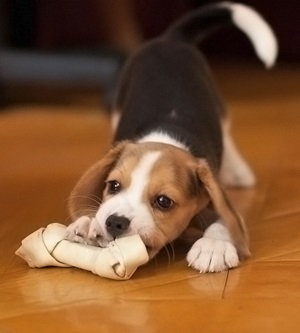 Regardless of the breed, puppies tend to bite and nibble at almost everything they can find. Moreover, this is a typical behaviour when they play with other dogs. Biting helps a pup learn how to use his teeth. Unfortunately, excessive biting can become a problem at some point because puppies have very sharp teeth that can hurt even if the pup does not mean to do any harm. If it's not stopped, biting can grow into serious aggression in an adult dog. You should train your puppy to stop biting as early as possible. Here are a few suggestions on how to do that. NOTE: Methods 1, 2, and 3 are more common and have been proved to be rather effective, especially if they're used together. Methods 4 and 5 should only be preferred if the first three did not work. Dog behaviour experts recommend the following. When the pup has bitten you, let out a sound similar to a yelp of another bitten puppy, or a high-pitched "Ouch!". The sound should be totally unexpected, loud, abrupt, and high frequency. If you have done everything right, the puppy will startle or recoil in surprise and confusion. After that, you can give him a toy he can bite, instead. This is a common way to redirect the pup's attention and to make him understand biting is hurtful, unpleasant, and had better be done with a toy (make sure your puppy has a lot of chewing toys). This is also a natural way puppies let each other know one of them has been hurt. You will probably have to repeat the above many times, but if you notice this trick does not produce desirable results, you should choose another one. As soon as the pup has bitten you, stop any interaction with him and go away, leaving him alone and ignoring him for a while. After you have repeated this many times, the puppy should realize biting makes him lose his game companion, which is not fun. Biting means a game is over. Get a spray bottle or a water gun. Fill it with clean water, set it to "stream", and keep it with you at all times. Whenever your puppy starts biting, spray him in the face saying "NO!" at the same time. Your voice should be confident, loud, and firm so the puppy understands you're in charge and you're not happy with what he's doing. If this doesn't work, add some lemon juice to the water. Most dogs hate the taste of lemon, so it's usually a good deterrent. If the above methods did not work and your puppy keeps on biting, try this. Note: use this method only if you are sure your pup will not bite hard! After the pup has taken your hand in his mouth, loosely hold his lower jaw between your thumb and forefinger. Do not squeeze too hard as it can hurt the dog; gently hang on so that your hand follows his mouth wherever it goes. Your pup should get the idea within about 10 seconds. If he ignores your hand next time you put it next to his mouth, praise him immediately! Provide the pup with a lot of toys he can bite. Photo by Lei H.
Playing with the pup, put on gloves that you have previously coated with a bad-tasting substance such as bitter apple. If the pup tries to bite, he should be repelled by the taste. However, there's a chance the pup will fear the gloves more than the act of biting itself, so it is not recommended to use this method very often. Regardless of the method you choose, you always have to avoid games that provoke biting such as tug-of-war games, wrestling, waving hands in front of the pup's face. Do not stick your fingers into his face, and do not allow the puppy to bite them. Some people think biting is an expression of love and affection, and they often find it cute, unintentionally praising the puppy with their mellow reaction. This teaches the dog biting is a fine and fun thing to do. Obviously, it's not the message you'd want to pass to your dog, so be sure to stop biting attempts whenever they take place. If your puppy is teething, provide him with a lot of chewing toys. Remember that if you don't take biting seriously from the very start, it can become a serious problem when your furry friend grows up. Never punish your puppy physically as it will only cause long-term fear and distrust. Verbalizing and ignoring are always best since puppies respond to voice intonations and body language very well. Do not forget to let all members of your family know how to treat a biting puppy, especially children. Also, do not leave your kids alone when they play with the pup.